My friend Chris runs a catering company in Edmonton, Canada, which specializes in seasonal fine dining for special occasions, corporate lunches, dinners, and other events. 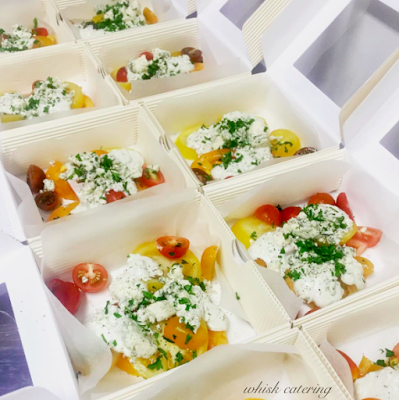 I came across his photographs through a social media platform several months ago and began following his posts, because I loved his attention to detail and his use of the freshest ingredients when catering. It was then that I was guided to his catering website, Whisk Catering, and began a dialogue with him. It turns out that Chris and I not only share a passion for cooking and baking la crème de la crème, but we both love to collect fine china, silverware and fine linens. After kindly agreeing to let me post about his company, I had a small Question & Answer session with him about how he got started and what continues to motivate him. 1. It's great to see that you began collecting tableware at such a young age. Tell us a little bit more about what you collect and about your antique stand at the Rocky Mountain Antique Mall. As a child, I always admired two tea cups and saucers that my mother received as a wedding gift. Somehow, I decided this was a collection I wanted to expand on…in short time I had an enormous collection of mis-matched tea cups and saucers; sourced from thrift stores, antique stores and various family and friends. I was hooked on treasure hunting! Aside from home furnishings, most of what I collect is dining related. I have a large collection of sterling and silver plate flatware and hollowware. I love good china, particularly Victorian un-marked pieces; I think they have a beautiful elegance to them. 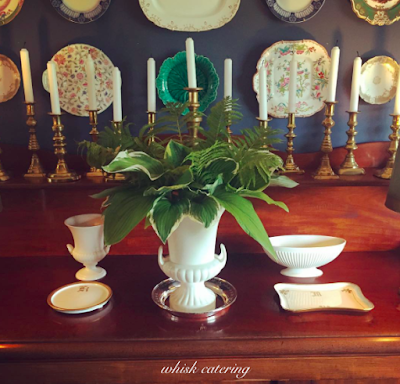 I have a large collection of antique table and bed linens, mostly all with mongrams with some letter or another; I love anything with a monogram. That’s Martha’s influence! Speaking of Martha, I have amassed a nice collection of cake stands. I was inspired years ago, by an old article in her magazine on hotel silver and have since found many great pieces that I cherish. I am a cook so I love collecting kitchen items! I am equally as excited to acquire a new knife or mixing bowl, as I am to find a beautiful piece of silver. I have a large collection of white Pillivuyt bake ware that I use all the time. I find it goes from oven to any table, elegant or casual really well. I also treasure my All-Clad pots for their function and form. 2. 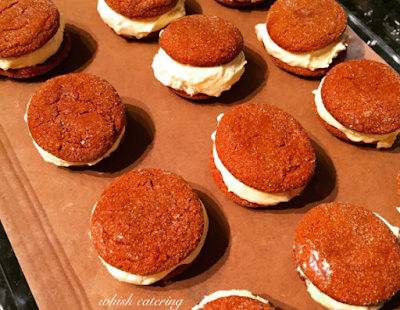 When did you begin your catering business and what prompted you to do so? I catered my first party in 2008, while I was working designing houses for a home-builder. A friend of mine gave me the opportunity to do so and it was a great success! I had already been interested in gourmet cooking for 15 years at this point so I had a good foundation and a real interest in food. I was in a career that I liked but catering and being a business owner, was more stimulating for me. A lot more physical work but more enjoyable. 3. I love your catering menu and I like that you have it divided up by season. Is this a reflection of your cooking style or is it based on client demand? My menu is divided in seasons because I like to use what is fresh and in season. I also think it’s nice to serve food based on the weather. In terms of menu planning, it makes it easier to narrow things down for myself and my clients. 4. As you know, presentation is everything. You seem to have a good eye for it and for combining food that is fresh & delectable. What are some of your favorites and is there a best seller? 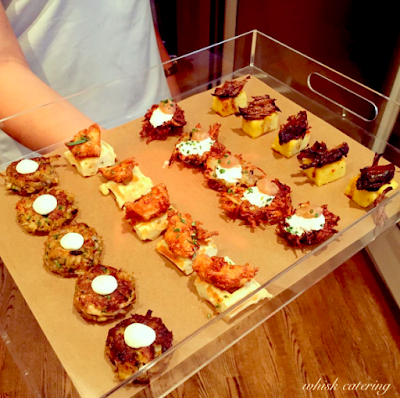 My clients all-time favorite hors d’oeuvres would be my mini chicken and waffles; buttermilk or polenta waffle, topped with a mini piece of fried chicken and maple infused goat cheese. Everyone loves them, young and old! I love using fresh figs when they are in season, topped with blue cheese crusted in walnut. Most of my hors d’oeuvres (my signature) end up being combinations of my favorite dinner and dessert recipes, scaled down. 5. Branding is very important these days, because it says a lot about the business. Was the single W your idea? If I remember correctly, the W was my idea, although I have to give credit for the name to my friend Tiffany. Branding is important and especially social media. It took me a while to figure out the game but I think I have a better handle on it now, than ever before. I would have to say my collections inspire me most. I don’t often go beyond my collection of cooking and entertaining books for inspiration. I’m inspired by my need for change and to try things in different ways. Martha, Ina and Cooks Illustrated are all great inspirations. 7. Tell us what sets you apart from the everyday catering business. My food is what sets me apart from other catering companies. I often sacrifice time and money to make things as ‘perfect’ and delicious as possible. The catering business is hard and it’s very easy for people to start cutting corners. As long as I’m in this business, I want to keep things small and focus on the quality. 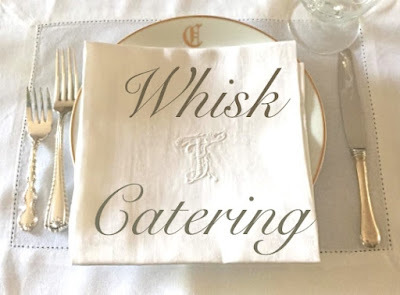 This is a sampling of Whisk Catering's menu. Whisk Catering's Caesar Salad Composée served on fine china is very enticing when its components are arranged like this. 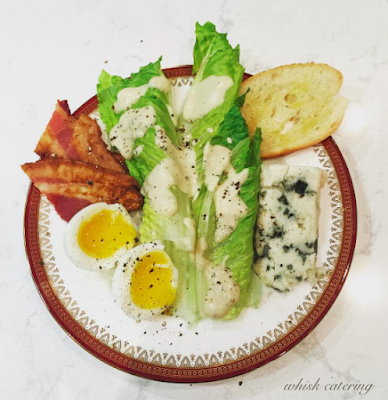 I love the soft-boiled egg with freshly cracked pepper and the slices of bacon. Tasty! 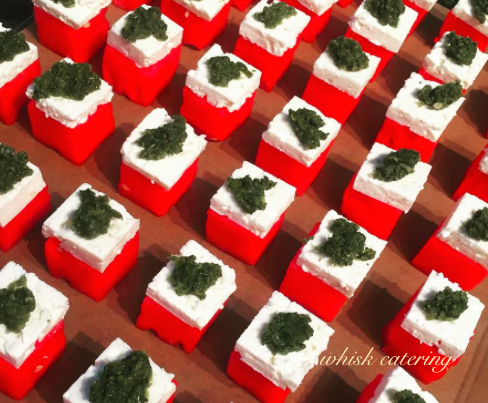 This artful arrangement of perfectly cubed watermelons topped with feta and spicy mint chutney is a client favorite. 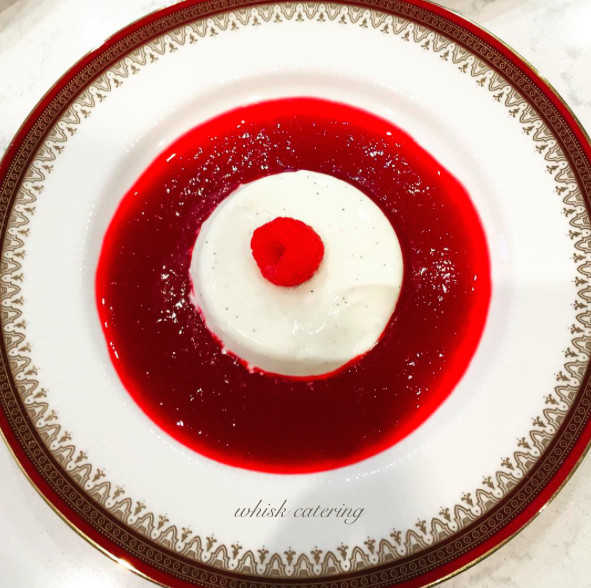 The cool, refreshing sweetness of the watermelon is nicely paired with the salty tang of the cheese and herbal bite of the fresh mint. I can understand why it's a hit with people. 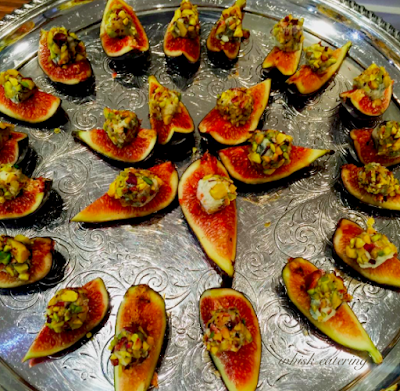 Fresh figs quarters topped with a blue cheese & pistachio mix are served on a round silver platter. During summer, when these fruits are at their peak, nothing could be tastier for an amuse bouche. Who wouldn't love to have these hors d'oeuvres at their next catered event? From left to right, we have mini crab cakes, chicken & waffles, latkes topped with sour cream & applesauce, and polenta squares with short ribs. Fresh, cooked to perfection, and irresistible. 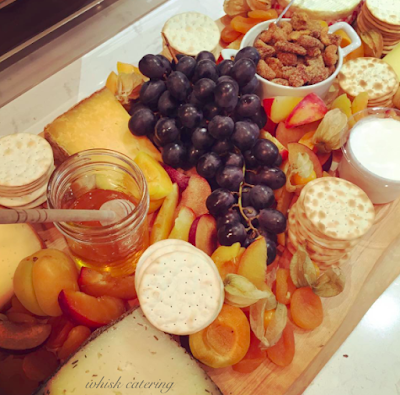 A cheese tasting is always appropriate if your gathering is meant to be casual. I love to have this type of arrangement if I'm going to be sampling a variety of wines. With printed out cards indicating what each wine can be paired with, the cheese tasting can turn into quite the conversation piece. For catered take-out, why not have heirloom tomatoes topped with a blue cheese dressing? Again, Whisk Catering's attention to the packaging here is flawless in my opinion. Cookies are my weakness if you don't already know. 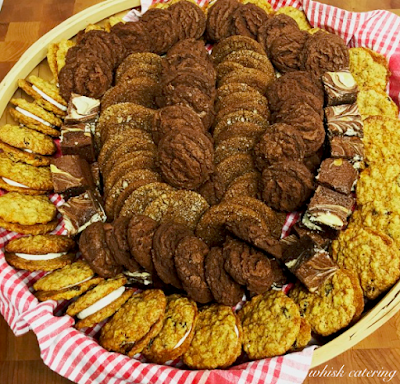 This basket which is filled with carrot cake cookies, swirl brownies, and spice-filled drop cookies, will have everyone reaching for seconds. 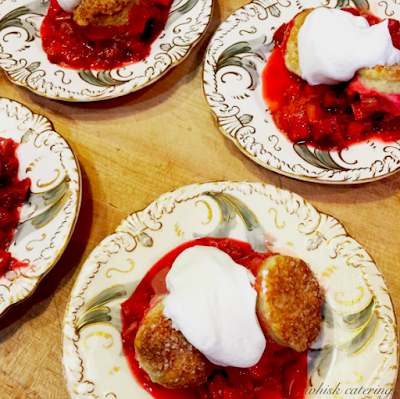 From Chris's personal collection of porcelain plates, we have a strawberry-rhubarb cobbler topped with freshly whipped cream. This is simply elegant. This photo makes me want to reach into the computer screen and take an ice cream sandwich or two. Freshly baked ginger cookies (topped with sprinkled sugar) get filled with Whisk Catering candied ginger and vanilla ice cream. Heavenly! Upon a client request, Chris created a vanilla pana cotta with raspberry coulis for dessert, and arranged it on a bone china plate. The color arrangement of this dessert is magnificent! If you're fortunate to live in Edmonton, Canada, and are in need of a catered event, I highly encourage you to visit the Whisk Catering website for more information. Click on his Menu tab to get Chris's seasonal lunch, dinner and hors d'oeuvres menu items and price points. His website makes it easy to pick and choose among your favorites, but if you don't find something that you really want, he may take special requests. At some point in our lives we will all be in the need of a caterer to help us with a celebratory occasion, so why not choose the best if you're in Edmonton, Canada?